Sitting in a Lloyd Loom chair on a Narrow Boat, moored on the Kennet and Avon Canal, a dead man stares into oblivion. Who is he and what is his name? Chief Inspector Michael Lambert from Thames Valley Police Authority unravels a murder case which stretches from Reading to Bulgaria, South Africa to Belorussia, and finally Taiwan to Peru. What at first appears to be a straightforward murder is revealed to be part of an international manhunt, the result of a major arms deal which has gone horribly wrong. 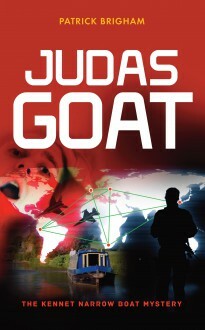 The story of Judas Goat begins with the discovery of a small mobile phone on the narrow boat and ends with the murder of a Chinese shipping magnate in the streets of London. Will anyone’s life be the same again and how will our provincial policeman cope with these different layers of intrigue?